The sun is shining and your little ones are begging to go outside, but as a nanny or parent you may have some concerns or reservations about their safety during the summer months. From sun poisoning and bike accidents to water safety and bug bites, fun in the sun can bring about dangers for your children. However, with some simple strategies to ensure their safety, you can provide your children with a safe and fun summer. It’s important when parents and nannies are talking about safety to do just that – emphasize smart rules for your children to follow to keep them safe, rather than focusing on risk or danger, says Tamar Chansky, founder and director of the Children’s and Adult Center for OCD and Anxiety in Pennsylvania and author of Freeing Yourself from Anxiety: Four Simple Steps to Overcome Worry and Create the Life You Want. Taking necessary safety precautions during the summer can also help guide your child in a safe and fun direction as she heads off on her bike or to the playground. According to Jennifer Hoekstra, an injury and prevention specialist and Safe Kids Program Coordinator at the Helen DeVos Children’s Hospital, common summer safety dangers include bike, pedestrian, playground and water injuries. Bikes: Kids should always wear a properly fitted helmet, ride on sidewalks and bike paths with an adult and wear bright colored clothing and closed toe shoes. Pedestrian Guidelines: Teach children to look left, right and then left again before they cross the street. Always use crosswalks or cross at the corner, says Hoekstra. Avoid distractions and limit your children from talking on the phone or texting while crossing the street. It is also important to wear bright and reflective clothing while walking. Playground Safety: Teach your children to always go down the slide feet first and one at a time. 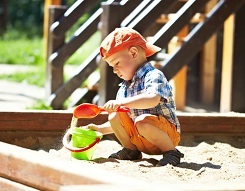 Be sure kids are playing on age appropriate equipment and check the playground for broken, unsafe equipment or overheated equipment before letting your children play. Make sure the area under the monkey bars is clear of debris and other children before letting your children cross. Water Play: Teach kids to never swim alone and as a parent or nanny, stay within arms reach of children who do not swim well. Once the water play is complete, empty all buckets and inflatable pools. “Active supervision is key all year long, but enjoy summer activities with your children and help them understand ways to keep themselves safe,” says Hoekstra. When the sun is shining, your children are at a greater risk for sun burns and over exposure to the elements. As summer officially kicks off, Registered Nurse Laura Holihan, with the Children’s Hospital at Montefiore, recommends reducing the burn and ensuring the season is fun for everyone by knowing the basics of sun safety. For best results, Holihan recommends a sunscreen with an SPF of 30 or higher. Keeping your child aware of smart rules, summer safety guidelines and strategies to stay hydrated will only enhance the season of summer this year.